Scientists are beginning a census of Royal Bengal tigers in the Bangladeshi part of the Sundarbans, the world's largest mangrove forest. It follows a similar study in the Indian part of the Sundarbans. The census is part of an initiative to preserve the biodiversity of the forest, which lies on the border between the two countries. 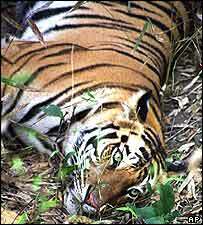 Early indications from India suggest that the tigers, previously thought to be dying out, are increasing in number. Fifty teams will spend the next week in the Sundarbans to get the first accurate picture of the state of the Royal Bengal tiger population in Bangladesh. The big cats are elusive, making counting them by sight impossible. Instead the scientists will look for paw prints left in the mud of the mangrove forest. Like a human fingerprint, each animal's pug mark is different. The Indian census took place last month. Although the data has not been fully analysed, scientists say they found more cubs than they expected, an indication that the tiger's numbers may be increasing. The tigers exist in an uneasy relationship with the human inhabitants of the Sundarbans. Every year, about 20 people fall victim to attacks while out in the forest. In turn, tigers that stray too close to villages are regularly killed. The full results of the tiger census are expected by July.